It was the cover art that led me to the horror fiction anthology Terror in 16-Bits, and by extension the back catalogue of its publisher, Muzzleland Press. Making a weekly pilgrimage to my Kindle to search for new titles to read and review, for once the ‘Recommended Reads’ actually threw up some titles that interested me, rather than ones that seemed to have little to no actual relevance to what I had been reading. Scrolling through, two titles immediately stood out due to the quality of the cover art, both published by Muzzleland. The first was High Strange Horror, also an anthology, which featured a distinctive piece of cover art that had fashioned the anthology’s title into one of those bright and garish neon signs that are so eponymous with American motel and bed and breakfast chains. 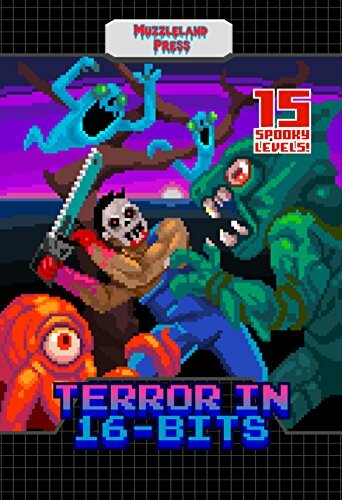 The second was Terror in 16-Bits, an anthology featuring horror fiction inspired by video games, which had an equally distinctive and eye-catching cover. I have a certain weakness for video game horror stories, having played several glitchy and creepy computer games over the years, as well as the many CreepyPasta stories on the internet which feature things like cursed save files and anonymous, death-dealing cartridges and flash games. I downloaded both anthologies, but decided to start with Terror in 16-Bits first, particularly since it seemed thematically appropriate after just finishing the incredible Lost Films anthology from Perpetual Motion Machine Publishing, which dealt with film and video-related horror fiction. The cover art for 16-Bit Terror is a fantastic piece of work by illustrator Peter Lazarski, and perfectly sets the tone thematically for the stories it contains. Designed to look like the cover for an old game cartridge, like the ones for the old Sega and Nintendo games I used to play when I was little, you’ve got the classic black and white grid-style backing, and then a pixelated piece of colour art on top. It features a variety of 16-bit-inspired monsters and ghouls, including a chainsaw-wielding and masked killer reminiscent of Leatherface, and the fonts are in the same pixelated style, which really meshes well with the imagery. I can’t help but admit I had a slight grin on my face as I moved into the book itself, and I suspect it will be the same for readers of a certain age, invoking memories of those earlier video game systems. As the cover text promises, the anthology contains ’15 spooky levels’ or stories, and although there’s no introductory chapter, I did appreciate the fact that each story ends with a short piece by the author explaining their thoughts about the story and what inspired them – it’s something that I occasionally see in anthologies and would certainly like to see in more collections. The opening story by Adrean Messmer, TPK, certainly sets the tone for the rest of the anthology – a disturbing and deliberately fractured, Memento-style story, we follow a group of former classmates who return to an old manor they used to visit, in the hopes of rekindling something – friendship, perhaps, or something deeper? Whatever it was meant to be, it instead led to heartbreak and tragedy. It’s an enjoyable story, as Messmer not only charts the fractures and scars naturally caused in a group of classmates who were never truly close, as well as gently poking fun at some of the more absurd game mechanics found in horror games like Resident Evil. The following tale, Centralia by Sean M. Thompson looks at the nature of virtual reality, and the perils of a VR horror game that tries to become too interactive; I must admit this one particularly resonated with me, as the idea of an interactive, VR-based horror game is genuinely unsettling to me, and Thompson deftly crafts a world in which reality and virtual reality blend and merge until it’s impossible to tell what is real and what is fake until it’s much too late. One of several stories in the anthology that takes a look at the costs associated with video game characters hitting that ‘Continue’ screen and respawning, or coming back to life, Dr. Coagulant’s Splatter Lab by Jonathan Raab. Raab expertly portrays the personality and memory-fracturing nature of resurrection time and time again, and there’s a great deal of uncertainty as the character, Caleb, fights against the monsters unleashed by the titular Dr. Coagulant, aided by the animated and disturbingly blood-crazed chainsaw he uses to fight these monsters. Who, exactly, is Caleb trying to rescue, and why? How is Chain Saw controlling him and managing to resurrect him each time he fails to win a duel with a monster boss? It’s a blood-soaked and gore-filled tribute to games like House of the Dead and unabashedly pulpy at times, but infused with an overarching atmosphere of tension and uncertainty that makes it one of the stand-out stories in the anthology. There are two stories in the anthology that really affected me on a personal level, burrowing into my head and refusing to let go long after I’d finished reading it. I’m a Good Person, I Mean Well, and I Deserve Better by J.R. Hamantaschen is a story I can only describe as insidious, weaving together a number of video-game tropes and contemporary issues to create a slow-burning and often disturbing piece of character-driven horror that has several violent twists that really got me thinking. I find it almost impossible to describe without spoiling such an intricately-plotted and thought-out story, but suffice to say it deals with notions of male viewpoints of women, unattained entitlement, and a savage deconstruction of the ‘rescued princess’ trope so common still in videogames and fiction. This story alone makes the anthology worth purchasing. Reset by William Tea is another story dealing the idea of character death and resurrection in an endless loop, although from the point of view of an NPC (Non-Player Character). What’s it like for one of those poor NPCs as they get jumped on, stamped on, shot, stabbed, eviscerated and otherwise violently killed by the ‘hero’ of a videogame? Tea does a great job of putting the reader in the body of one such NPC, and it’s extremely difficult not to feel a sense of grim satisfaction when they’re able to finally wreak long-awaited revenge. Leeds 2600 by Matthew M. Bartlett is a mind-bending and reality-bending piece of fiction that plays with the trope of the ‘mysterious/unknown video game cartridge’, in this case an apparently hand-made Atari cartridge made for a young girl by her older cousin Kendrick. Supposedly just a simple game to keep her entertained, she soon finds that the game is unlike any she’s played before, becoming incredibly addictive to play and eventually starting to affect reality itself. While on the surface the story arc is a standard cosmic horror-style narrative of a game altering reality and the mind of the player, Bartlett does so much more with the subtext, drawing in some fascinating and often disturbing ideas about family relations, social isolation and even potential child abuse. Combined with an extremely unreliable narrator, you finish the story by questioning the nature of what the ending means, exactly – was there ever actually a video game, or was something far more banal responsible for Loretta’s situation? It’s a slow-burning and often uncomfortably thought-provoking story that really does justice to the theme of the anthology. Angels’ Armageddon by Amber Fallon is another story that deals with the trope of the ‘killer game’, one that is only known about in fragments of video and third-hand stories online; but while the trope may be close to being worn-out, Fallon’s story certainly isn’t. She expertly shows how an obsessive personality can become hooked on finding such a video game, and the way in which the protagonist begins to sacrifice everything in his already meagre life to try and own the game is darkly disturbing, the moreso because as the reader you’re well-aware that nothing good will come of finally managing to locate it. I have to admit that the ending twist wasn’t something I was expecting – it threw me slightly, in a good way, and gave the story an edge to it that really made it stand out. I mentioned that there were two stories in Terror in 16-Bits that really got to me; hit me on an emotional and almost transgressive level. The second of these is the anthology’s closing story, The Drunkard’s Dream by Orrin Grey. At its most basic level, the story is about a long-forgotten, near-abandoned old arcade game that portrays character’s progress into Dante-like levels of hell, defeating various thematic bosses that rapidly increase in difficulty. It’s certainly an interesting idea, easily blending in with many of the hyper-violent games that could be found in arcades, but the real body of the story is in the structure of the game. Chapters in the story alternate between a description of a particular stage of the game, and the life of the man who discovers the game and becomes obsessed with playing it to completion. There are hints early on in the story that life has taken a bitter turn for the nameless protagonist, but it’s only as he progresses with the game that the true horrors are revealed. And for once, they’re not supernatural horrors; there are no monsters jumping out of virtual reality, cursed game cartridges or NPCs searching for bloody vengeance. Instead the horror comes from something incredibly personal, an intimate tragedy that utterly destroys a relationship, rips the heart out of him, and the stages of the game clearly come to represent the man’s journey through the wreckage of his life. Just trying to describe the story feels utterly inadequate, because only by reading it directly is it possible to feel the power in Grey’s prose, the huge amount of personal experience that has been poured into crafting such an amazing, heart-wrenching and often brutal tale. This is the sort of horror fiction that could only truly be written by someone who has had first-hand familiarity with the subject matter, and in a way I felt strangely privileged to read it, as if a door had briefly been opened into someone’s soul in a very raw and emotional way that I don’t think I’ve ever experienced before. It isn’t a story that is easy to read, and I felt emotionally drained after finishing it for the first time; but I also felt like it had changed me in some way, which again is something I’ve never had happen to me. There are a few stories in Terror in 16-Bits that didn’t work for me, either because I just couldn’t engage with the subject matter, or the manner in which the story was written. However, there were relatively few of these, and the majority are fantastic pieces that really engaged with the theme in some interesting and even thought-provoking ways, interrogating many of the tropes and themes associated with video games; and the editor is to be commended for pulling together stories that range across the entire spectrum of the horror genre, ensuring that fans of almost every kind of subgenre are going to be catered for and find something to like. It’s a deeply enjoyable anthology, with some fantastic cover art, and I’m a Good Person, I Mean Well, and I Deserve Better by J.R. Hamantaschen and The Drunkard’s Dream by Orrin Grey are the two star stories of the anthology; they are both brutal, haunting pieces of horror fiction, both deeply personal in their own ways, even transgressive at times, and these two alone justify purchasing the anthology. Terror in 16-Bits comes highly recommended, and I look forward to seeing what else Muzzleland Press have published.